Derbyshire have moved to reinforce their top-order by signing experienced New Zealand international batsman Neil Broom on a two-year deal. The 31-year old, who also holds a UK passport, will be available for all forms from next summer and is eligible to feature alongside compatriot Hamish Rutherford for the entire campaign. Broom made his international debut in 2009 and has featured in 22 ODIs and 10 Twenty20 Internationals for New Zealand. The right-handed batsman has also featured in 109 first-class fixtures, scoring 6,427 runs at an average of 40 and hitting 15 centuries with a top score of 203 not out. Elite Performance Director, Graeme Welch said: “We’re delighted to have Neil with us for the next two seasons. 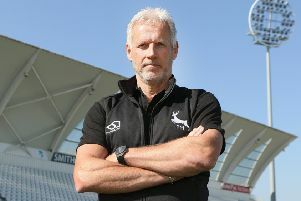 “We know we need to strengthen our batting and adding a player of Neil’s experience and calibre will certainly do that. “He has competed at the highest level and played with Hamish Rutherford before so we know he’ll bring us something extra both on and off the field. Broom added: “It’s a great opportunity for me to be able to play all forms in England over the next two summers.